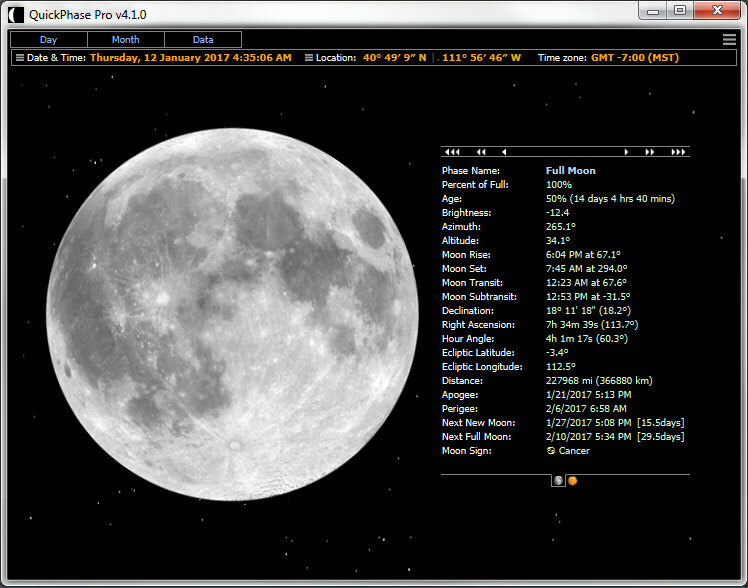 We are excited to announce that Version 4 of the popular moon program QuickPhase Pro is ready. The visual appearance everyone has come to know and love is the same as the current version, but everything "under the hood" has changed dramatically. We've rewritten almost everything from scratch. It includes a number of advanced new features that have been frequently requested. It also runs on both Windows and Mac desktop systems (Mac lovers rejoice!). Do you already own QuickPhase Pro (version 3)? This new version will work alongside it without any conflict. No need to uninstall. So there is no risk in trying out this new version, and/or using both. Also as an existing QuickPhase owner, you may contact us for a special upgrade discount. For more screenshots click here or check out a long list of features here.